In recent years, Mountain Goat has tended to kick off the new year with a big, hoppy IPA and 2018 is no different. 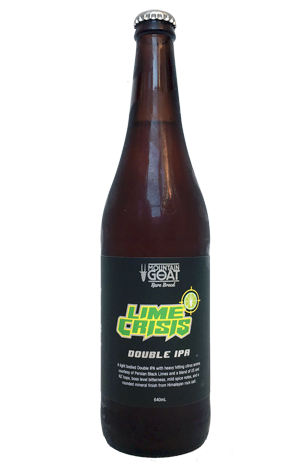 Indeed, Lime Crisis – a beer that shifts their pop culture naming pattern of recent times from the movies to gaming – is a double IPA measuring a hefty 8.2 percent ABV. Why Lime Crisis? Joining the American and Kiwi hops is a dose of crushed Persian Black Limes (not to mention a sprinkling of Himalayan rock salt). Given the choice of hops, there's little surprise you pick up lime and citrus, particularly aroma wise, while they add a spiciness to taste too. The brewers' intention with the rock salt was to add a "rounded mineral finish" to the beers and, in combination with specialty malts that add caramel characters throughout plus some sweetness and body from the alcohol, it is a more fulsome IPA than many doing the rounds these days. Indeed, while there's a bitterness that builds over time, that sweetness masks any potential fierceness.